Medical devices maker HeartSciences has secured CE mark approval for MyoVista high sensitivity electrocardiograph (hsECG) testing device. The device will be used to measure the heart's energy during each heartbeat by using an advanced signal processing called continuous wavelet transform (CWT). It offers physicians with a detailed visual image of the energy distribution during the cardiac cycle. The signal processing technology will enable to close the diagnostic gap by offering a low-cost and front-line tool that helps in the early detection of cardiac dysfunction. According to the company, MyoVista hsECG technology detected cardiac dysfunction in the resting phase of the cardiac cycle with 88% sensitivity and 87% specificity during the validation trial. The 200-patient study evaluated the presence of left ventricular diastolic dysfunction. The company is also planning to distribute MyoVista hsECG device in Australia, the Middle East, Latin America, Asia-Pacific and Canada, in addition to the European Union. HeartSciences chairman Andrew Simpson said: "Currently, there's a significant diagnostic gap in detecting heart disease early, resulting in a burden on both patients and healthcare systems. "We believe MyoVista hsECG could play an important role in achieving the preventative treatment ambitions of many healthcare systems as well as help reduce unnecessary healthcare expenditures." MyoVista clinical trial lead investigator Dr Partho Sengupta said: "High sensitivity ECG technology holds significant promise for improving the detection of heart disease." 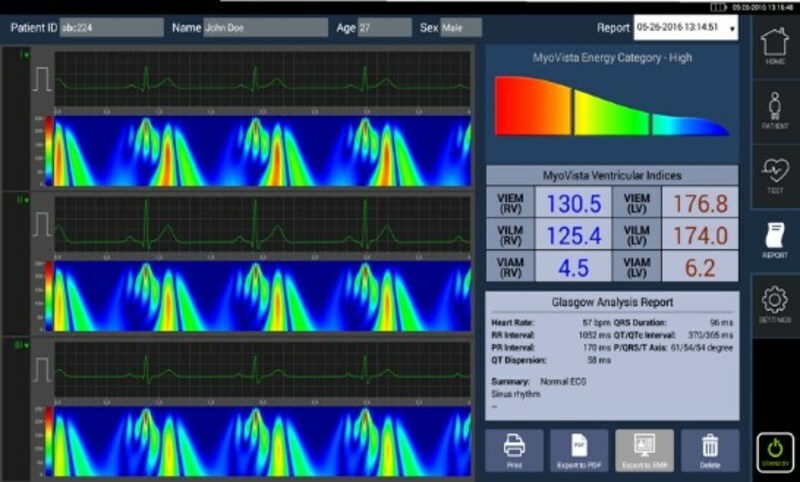 Image: MyoVista has ECG testing device will provide detailed visual image of the energy distribution during the cardiac cycle. Photo: courtesy of PRNewsFoto / HeartSciences.